Heat the oil in kadai/pan and add jeera. Add the mashed potato and and coriander leaves fry till everything mixes well. Add the crumbled/grated paneer and mix well. Remove from heat and keep aside. Add the crumbled bread and make a dough. Pinch out a small ball size dough and give a cylindrical shape as shown in pic. Keep aside. Grind the bread to make a breadcrumbs. Take maida/all purpose flour in bowl and add little water to make a paste. 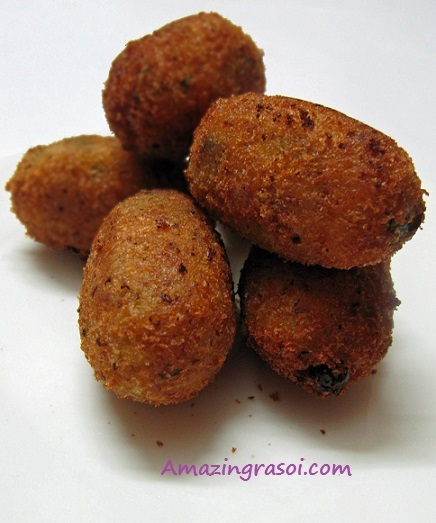 Take a cylindrical shape cutlet and dip in all purpose flour paste as shown in pic, then roll in breadcrumbs. Make sure that cutlet is well coated with breadcrumbs. 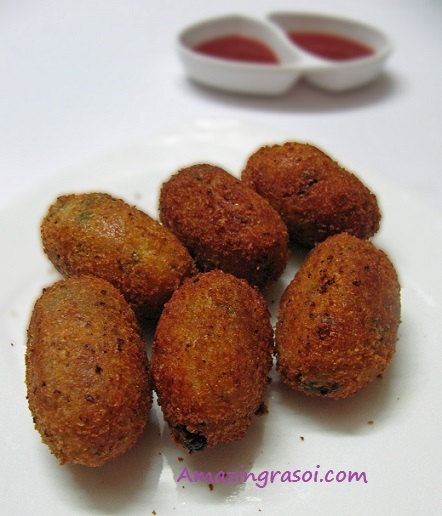 Heat sufficient oil in kadai/pan and fry these cutlet on medium heat till golden brown in color. Take out and serve hot with sauce. Can use store bought breadcrumbs, but home made breadcrumbs give more crunchiness.